Today there feels to be more promise of change than I have felt in some time. The overwhelming victory for the YES vote in Ireland’s gay marriage referendum has given many of us cause for excitement and the promise of good things to come. As you will well know by now if you have been reading the news about the Irish vote, there are many countries, 21 in fact, that have now legalised gay marriage. But what is astoundingly positive about the Irish result is that this is the first time the decision has been given to and made by, the people of that country. Every other change in this law has happened through the legislative process initiated by the government of the day. 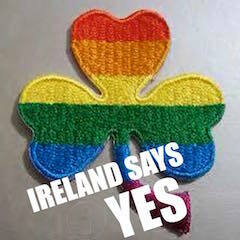 But in Ireland this is a constitutional change, a change to the highest law in their land. It is also worth commenting that Ireland has historically been a very conservative country with a strong influence from the Catholic Church. Homosexuality was only legalised 22 years ago, divorce was illegal until 1996 and abortion is still not a choice for women. But this result has been overwhelming – as I suspect are the celebrations that are occurring right now! More than 62% of those who voted, voted YES. And more than 60% of the population turned up to vote, with many travelling home from abroad to be part of this historic event. Yet this is a highly conservative time globally and we are witnessing many unfair and unjust events as well as extreme inequalities. But maybe this vote in Ireland can give us pause to remember that change is possible and is happening – maybe not as fast as we would like or as thoroughly as we might hope for – but it is happening all around us. And it seems that it is more commonly happening not through our political system but through ordinary people saying they want change – and that is the key to how we might create a more equitable and peaceful world. I have recently been listening to one of my old companions on this journey for social change – Cat Stevens, and I have had his song ‘Peace Train’ in my mind for several weeks now. Maybe out there on the edge of darkness there really is a peace train coming to change this country.